This is the first and hopefully one of the many deck analysis that I would put up. I am not at all a pro, so take my comments with a grain of salt and a large dose of your own opinion. If you have any views or opinions, please post them in the comment section! Thanks! Now, general deck idea would seem to be a beatdown deck. With 12 criticals, the deck tries to create columns that hit the magic number to pressure your opponent. With the 12 critical triggers, your opponents will be forced into more pressure. So let's Start with the Grade 3s. 4 Alfreds and 3 Palomides. Palomides is straight forward beatdown. Together with the Marrons and Toypugals, you will have your 21k and 22k columns to force your opponents into a 15k guards if their vanguard is 10k/11k. Alfred with a full field will be 20k, meeting the min of a magic number, with 4 rearguards, 18k, meeting the magic number for crossrides. You are also able to use his counterblast to finish making your ideal field. Now the first thing you may notice is the 5 10k vanilla. Now, currently the 10k vanillas may not be as useful in our english meta as the Japanese, as we do not have any crossrides yet. The 10k Vanillas, together with Marrons and Toypugals will meet 18k, the first magic numbers for crossrides. With the rampant running of DOTE in the Japanese meta, this is actually quite important. They can also be used to intercept, which frees the space for your palomides to come in. 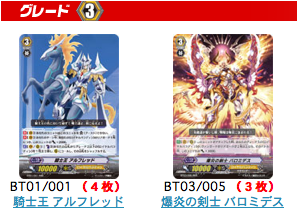 4 Blaster blades, almost a card staple in a Royal Paladin deck, although not always at 4, allows you to retire any irritating rearguard that your opponent may call into the field(since using only 2 cb, will allow you to use your alfred's cb). Also, with Iseult, will hit 15k, with Liens, toypugals and Marrons will hit at least 16k. The 2 Akane will allow you to fetch out the toypugals which you may need to complete your columns, intercepting after that. However, with Lien will reach 15k and at least 16k with Toypugals and Marrons. 4 Iseults, Staples, almost every deck in the Japanese meta will contain 4 perfect guards to guard against crossrides and other big hitters. Marrons and Toypugals, will complete your 21k columns together with Palomides. 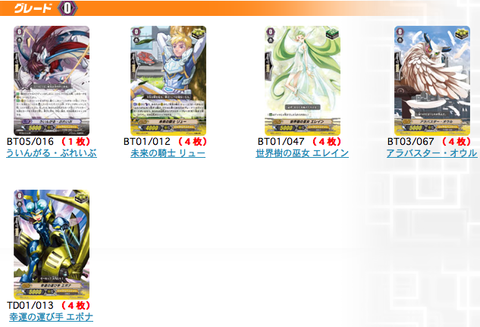 They will also allow you to hit 16k with Blaster blade, Akane and 16k with the 10k Vanilla. The 3 Lien other than making 16k Columns will allow you to cycle cards you do not need, such as Alfreds when you have already ridden one. Since Alfred cannot be boosted, Lien will most probably go under your Vanguard so that you can still use its ability with Alfred as your vanguard since it can't be boosted. Making use of all the cards in your field. 12 Crit triggers, maximum pressure to your opponent. 4 Heal Triggers, Self explanatory, almost in every deck. Wingal Brave, with Barcgal being banned as Starting Vanguard, just the next better alternative since Drangal is only useful in a Galahad Deck, Bluegal in a High Beast Deck. Wingal Brave allows you to get another Blaster blade if it boosts a Blaster Blade, Since you have 4, it's quite likely. The perfect field will most likely be Alfred as your vanguard with Lien behind it. One or two columns of Palomides and Toypugals/Marrons to finish your opponent. Else one column is Blasterblade with the Grade 1 boosters to reach 16k. This deck is fast, easy to complete your perfect field, straightforward and hits hard. With Alfred, Akane and Lien, they allow you to get the cards that you want to complete the perfect field for you to end the game. 12 Crits puts maximum pressure on your opponent. A lean and mean machine this deck is. As this deck do not have any Draw triggers, you may not be able to gain as much card advantage, however, Alfred, Akane and even Blasterblade would be able to help you with that problem. You should also mention that Wingal Brave can boost Palomides to hit the magic 18K when facing crossride units.